A Canstar Blue survey has found that 59% of women have burnt themselves while using a hair straightener. You might be among those who have held a hair straightener too close to your scalp and burnt yourself. Or you might suffer from allergies to some of the ingredients commonly used in hair products such as shampoo or hair dye. Ouch! 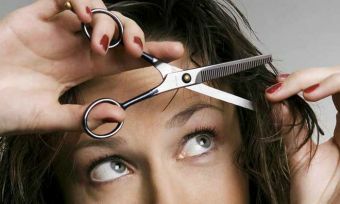 Whatever the reason, your scalp is hurting and it’s time for some serious TLC. Here are some effective home remedies for those who don’t want to fork out wads of money for salon-level scalp care products. Dandruff shampoos contain chemicals that can irritate your scalp if the cause is not, in fact, dandruff. So steer clear unless you know your flakes really are dandruff. Don’t scratch it – even if it’s really itchy! Fingernails are the dirtiest part of the human body, and scratching your scalp with them can cause infection. Besides, scratching just lifts up flakes of skin, making it look like you have dandruff. Don’t style your hair with heat near your roots – no blow drying, no hair straightening. And try to keep hair products away from the roots of your hair until your scalp is healed. Take a look at our recommended YouTube channels for some great no-heat styling tips for braids and other up-dos. Did you know that dermatologists sometimes use 2% milk on chemical burns? Soak a washcloth in cold milk and apply it to your scalp for up to five minutes. Yoghurt mixed with a baby shampoo will do a similar job, although it can be less effective. Why milk? It has enzymes and proteins that promote healing – and the coolness of the milk helps reduce inflammation. The antioxidants in green tea (or chamomile tea) are soothing for stings like scalp burn. Soak two tea bags and let the tea cool to lukewarm. Gently massage the tea onto your scalp, leave for 5 minutes, and rinse it off again. Tea tree oil and lemon juice are nature’s antiseptics. Dilute with water or baby shampoo before you apply either, to prevent the sting of antiseptic against irritated skin. You can find either of them in the supermarket, and tea tree oil is also available at any chemist. If you’re short of both of these, washing your scalp with vinegar will actually do the same job, by balancing the pH in the skin to stop pain pretty much instantly. Then you can apply a nice moisturiser and let your scalp heal without fear of any scarring. Jojoba oil is an amazing moisturiser, which is why it’s become so popular in recent years. Same with coconut oil – it feels delightfully soothing, accelerates skin regeneration, and stimulates collagen production to repair your skin tissue. Mix either of these with your shampoo before washing your hair, or apply them after washing and gently towel-drying your hair. Either will calm a smarting scalp and begin the skin repair process. Aloe Vera isn’t just for sunburn – it helps with many different types of burns and skin irritations. It’s a great moisturiser, and one bonus is the fresh smell. If you were in the ‘burnt by the hair straightener’ group, it might not be entirely your fault that you got burnt. Take a look at how old your appliance is, as it may need an upgrade. Modern technology is better at protecting our hair, and modern hair straighteners have more heat settings – so you can set it to a low setting to straighten more safely.